If you’re looking for a cancer-fighting smoothie, then you’ll love this recipe. My Anti-Cancer Green Breakfast Smoothie is dairy-free and vegan, with a secret frozen ingredient. 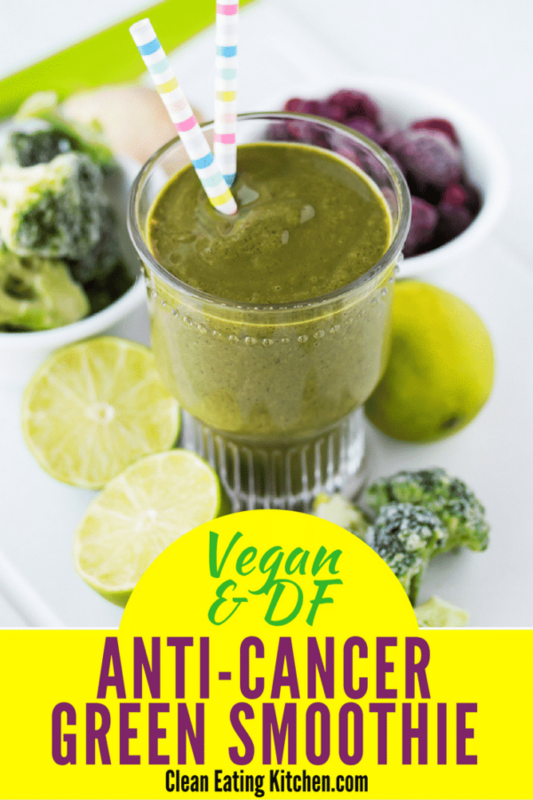 I’m excited to share the updated version of this Anti-Cancer Breakfast Smoothie, originally shared way back in 2013. This recipe is pretty much an evolution of my Energizing Green Smoothie, but with a special ingredient: frozen broccoli florets! Did you ever think about using frozen broccoli florets in a smoothie? Please hear me out! You may not believe me, but you actually can’t taste the frozen broccoli once it’s blended with all of the other great ingredients in this recipe. The fresh ginger, lime juice, and mint leaves are especially important to covering up any of the “green” flavor of the veggies. You have to try it yourself! What Ingredients Make This a Cancer Fighting Smoothie? Studies show that there are compounds in cruciferous vegetables such as broccoli that fight cancer. How cool is that? However, as far as we know, these compounds are only present in raw cruciferous, not cooked. So, I chose to add these raw, frozen florets to my green smoothie. As mentioned, I can’t even taste them (I usually can’t stand the smell or taste of broccoli) and they actually thicken the overall smoothie. If you’re a fan of broccoli, you might also like this easy step-by-step guide for how to sprout broccoli seeds on your countertop without dirt! Sprouting your own broccoli seeds and eating a tablespoon or two a day is another way to help prevent and fight cancer. Cancer is an incredibly scary subject, and I was blind-sighted when I was diagnosed with thyroid cancer in 2012. At that time, I had already started my health journey and thought I was doing all the right things, but I likely had a childhood exposure or possibly experienced the result of eating the Standard American Diet for too long, or some other combination of events that led to my diagnosis. Fighting cancer is hard and being a survivor is not a title or role I take likely. I don’t mean to try and scare you, but I do think there are foods we can eat and lifestyle techniques we can practice every day to help prevent cancer from starting or recurring. My husband and I have had two family members diagnosed with cancer recently and it has been very scary and sad to see them struggle with such a challenging situation. With so many nutrient-dense ingredients, I call this the Anti-Cancer Breakfast Smoothie. Combine hemp seeds and water in a high-speed blender. Next, add the frozen banana, frozen strawberries, and pomegranate arils. Lastly, add the ginger, greens, mint, cocoa powder, flax meal, broccoli, and lime juice. 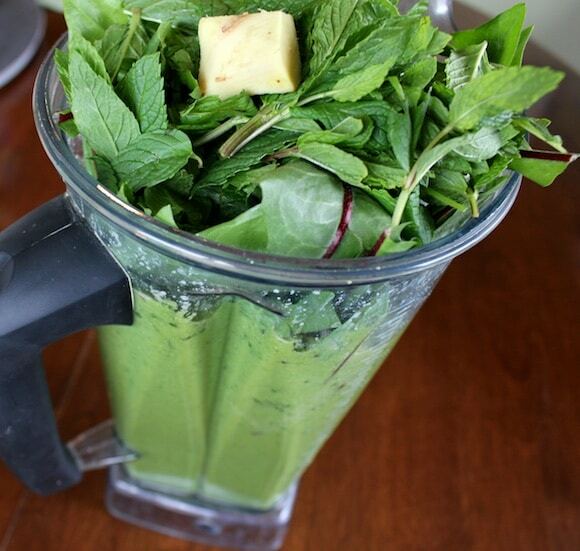 Place the lid on the blender and blend until smooth, about 45 seconds. Doesn’t this just scream “eat me, I’m healthy!”? I think so! Fortunately, healthy also equals delicious in this case. 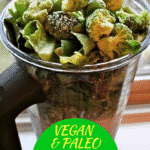 If you’re looking for other cancer-fighting green smoothie recipes, you might also like my Broccoli Sprout Smoothie or my Healthy Vanilla Smoothie with frozen cauliflower! 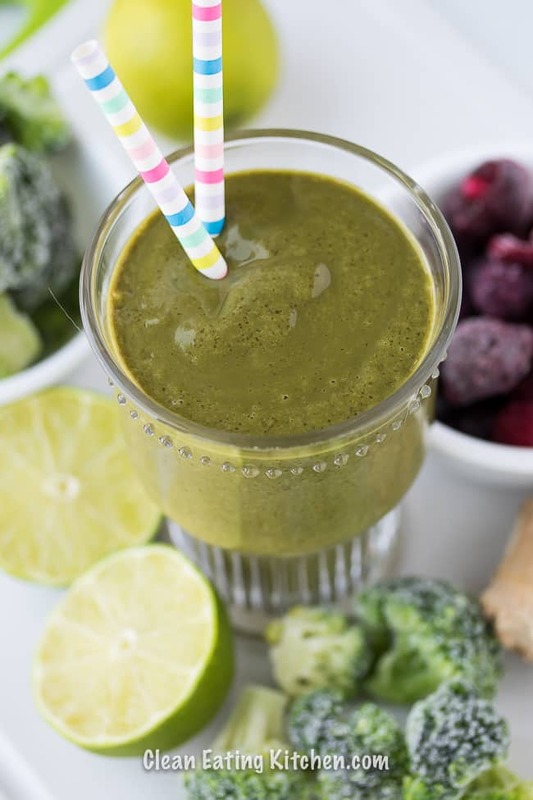 Do you drink green smoothies and do you have any secret ingredients you’d like to share? 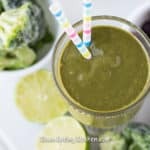 Be sure to pin this Cancer Fighting Green Breakfast Smoothie to your healthiest Pinterest board to save it for later. I didn’t know that about broccoli, and I haven’t ever tried it in a smoothie. I usually stick to spinach and kale. I have everything to make this though, so I’m going to try this for breakfast tomorrow. Thanks a bunch! Hi Isobelle, let me know when you try adding the broccoli and if you like it. I can’t even taste it but I love knowing I’m getting the health benefits of the broccoli. Re: your question – I like adding flax seeds (which grind down into meal) or flax oil, and the occasional handful of spinach or kale to my smoothies, but it appears as though you already do that! Oh, a spoonful of almond butter can be delicious, too! Thanks JD! Let me know how you like the broccoli in the smoothie. I honestly can’t even taste it. I love your idea of adding a spoonful of almond butter to smoothies, I haven’t tried that and I bet it’s delicious. Yes, do please link my post to your blog, that would be really great. I’m definitely going to try this smoothie recipe! I love the idea of using frozen broccoli in it. I don’t taste the raw spinach in my smoothies and mine are pretty basic with no sugar but the 1/4 to 1/2 of a ripe banana. Frozen watermelon sounds like a GREAT idea! I’m still a bit freaked out by green smoothies, but I’m soon going to try one, probably this one! Chia seeds! I love how they thicken it up! I also love to toss in whole, peeled oranges. I prefer bananas for sweetening. Great suggestions! I love chia seeds but for some reason have never added them to smoothies. And, I will definitely try adding oranges when they come in season. Thx! Just made this smoothie this morning. Though we start every day with a green smoothie, this was the first time we incorporated broccoli to it. Though I did taste the broccoli, I didn’t mind that, and I think the fact that it was frozen added nicely to the smooth texture. We had some greens from the CSA, which I later realized were mustard greens, so that was a bit odd. But all in all, we loved it anyway. We also didn’t have any bananas, so added a bit more mango. But it was extremely filling and really good!! 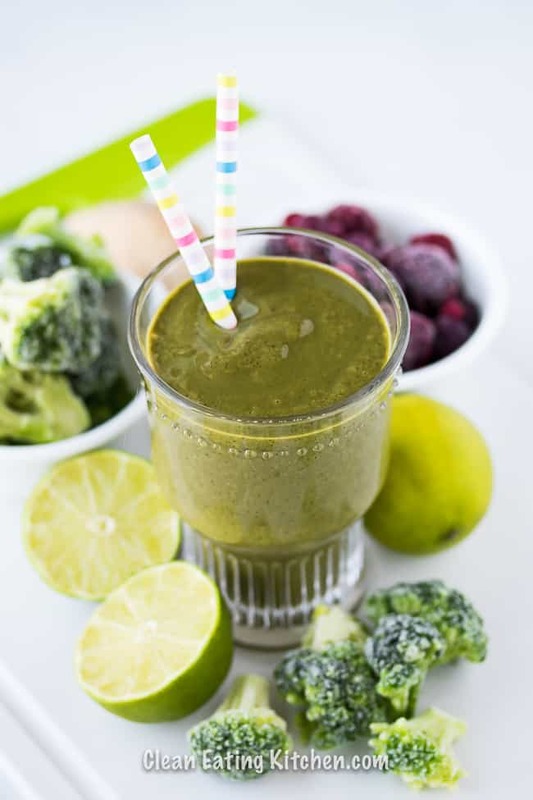 Our usual morning green smoothies are something like: frozen spinach, frozen berries, to smooth the texture we throw in some frozen peaches or mango, spirulina, Vega powder, and water. There are, of course, a zillion variations, including chia seeds, flax seeds, ginger, adding fresh-squeezed juice (like apple/ginger/kale juice), etc. We try not to use too many bananas, but the Vitamix still keeps it a lovely texture. This was a great recipe. I’m really happy to have discovered it. Thank you, as always, for the creative suggestions, Carrie!! Hi again! I have used mustard greens in my smoothies and have to say that I cannot STAND the taste of them. Naaaasty! I’m glad you liked the smoothie overall, I really like using the hemp seeds because I don’t eat enough of them otherwise. I like your suggestion about adding veggie or fruit juices to the smoothies as well, I am going to have to try that. Thanks For Reminding Us Of Your Special Ingredient Broccoli For Anti-Cancer Green Smoothies! You Are Right, According To My Recent Research On What To Put Into Cancer Fighting Smoothies. Kale & Broccoli, Asparagus, Parsley, Steamed Cherry Tomates Or Asparagus & , Brazil Nuts Are Some Of The High Alkalizing Anti-Angio-gensis Foods That Cut Off The Blood Supply To Tumors, According Dr.William.L i Of TEDTalks. I Was Concerned About The Fruit Sugars For Cancer Patients In These Smoothies Since Acidosis Is The Primary Problem. I Appreciate Any Insight On This, Because I Believe Smoothies Should Be As Tasty As Possible, Also. So, When Do We Have Enough Fruit Sugars In Our Smoothies? Cool, let me know how you like it Olivia! Yes, the broccoli is raw although I think some manufacturers blanch it before freezing, so I’m not 100% sure. I really like the taste of asparagus so I haven’t used it in a smoothie, I usually eat it as part of a salad with lunch or dinner. Hi Lisa! Brilliant!!! I LOVE the idea of using ginger in a smoothie, I am already imaging the amazing combos I could make: pineapple, ginger and strawberries is coming to mind. Thank you! 1/2 Avocado is my favorite in a smoothie, it just seems to give a really creamy texture. Bananas no matter what, flax too. Everything else is up in the air! So do you just put the tofu in the blender straight from the package or do you cook it? I didn’t think you could eat tofu raw! Also, where did you find frozen pomegranite arils? Did you buy fresh and freeze yourself? Just wondering…is this all you consume for breakfast? Does it last until lunch? Thanks. Thanks for the question, Joan. Yes, my smoothies do fill me up for my morning workout until lunchtime. I sometimes add a scoop of protein powder to get more nutrition. 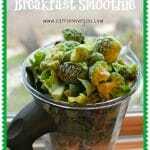 There are a lot of cruciferous veggies you could throw in there and get the same benefits. Look up a list. All cruciferous veggies originated from one wild mustard plant. Cool, random facts. Hi what if I cannot get my hands on hemp seeds, cacao powder, pomegranate arils and flax meal? Hi Sue. You can substitute any non-dairy milk for the hemp seeds. You can use regular cocoa powder instead of cacao, substitute any berry for the pomegranate, and just leave out the flax meal. With so much left over, can the smoothie be consumed a day after it’s been prepared? My green smoothie is similar to yours, and with broccoli, also. I also started to add in mushrooms at times, and I hate mushrooms – the texture. When I use either broccoli and/or mushrooms, I have to do them in a food processor first – I have a small one cup food processor that works great for it. Not sure how it works with them frozen, but with fresh it chops them both up small enough that I don’t even notice they’re in there. 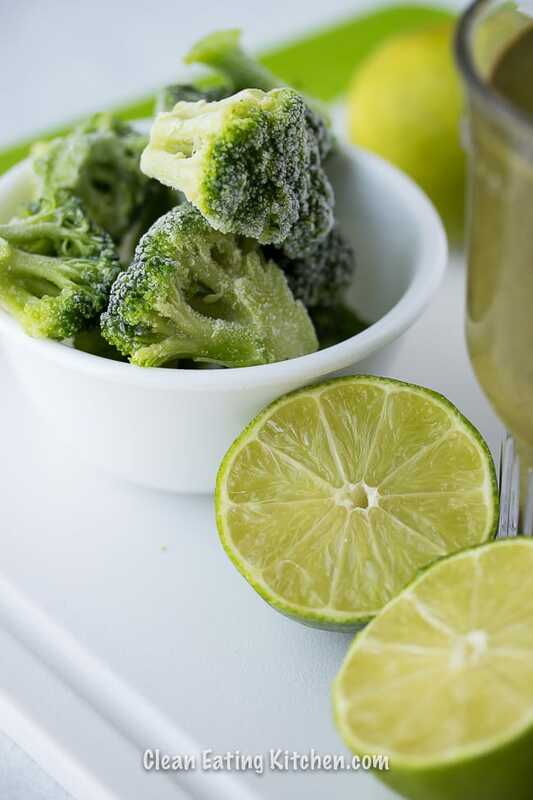 Broccoli is blanched before its frozen – like many other vegetables. Blanching = immersing briefly in boiling water. This is done to stop certain enzymes to work and keep it fresh green looking. But for broccoli to do its anti-cancer magic you need the same enzymes blanching just killed ! So you have got to use fresh broccoli here or even better, broccoli sprouts. I hope this helps! Thanks for the recipe! One of my favorite smoothie recipes! Hi! I am wondering why you steam some of the greens before you use them? To reduce oxalates and make them easier for me to digest. I didn’t read all of the comments so I apologize if someone asked this and you answered it. Did you have your thyroid removed? Did you have to do any treatments or did you turn down treatment? I was just diagnosed with thyroid cancer recently.